2017 has been a year of expansion in climbing; for the sport, the industry, and the community. With every passing year, climbing makes its way a bit further into the mainstream, and in 2020, we'll see climbing represented in the Olympics for the first time. As we expand in size, we've also expanded our attention to issues like sustainability, environmental impact, and diversity in the outdoors. At The Cliffs, we've announced our expansion to two brand new gyms in 2018, one in Harlem and the second in Philadelphia, our first gym outside of New York. And at the top of the sport, there are the athletes who expand our idea of what is possible, constantly pushing climbing to the next level. Female athletes have been on a rampage this year in particular, making the gender achievement gap ever narrower. Margo Hayes became the first woman to tick a confirmed 5.15a, and she did it twice within a few months, first on La Rambla, then on Biographie. Anak Verhoeven was the first woman to FA 5.15a, and Angy Eiter kicked it up a notch further when she became the first woman to send 5.15b. Adam Ondra took down his long term project, Project Hard, and called it Silence 5.15d, the first of the grade. And possibly the craziest achievement of them all was Alex Honnold's free solo of El Capitan, the biggest, tallest, and hardest cliff in Yosemite. In bouldering news, Nina Williams kicked off her year by topping out one of the most notorious bonecrusher highballs, Ambrosia V11, just days before the second Women's Climbing Festival hosted by Flash Foxy. We were psyched to send a whole crew of Lady+ Crushers, staff and members, to the third festival held in Chattanooga this fall, as well as a few of #thecliffscommunity to a new festival that sprung up in the Southeast, Color the Crag. Hosted by NYC's own BOC Crew along with DC-based Brown Girls Climb, Color the Crag is the first climbing festival that celebrates diversity in climbing. Our scholarship recipient Maryam Adamu detailed the weekend in her blog post "Lift As You Climb." Outside the realm of athletic accomplishment, we saw the climbing industry use its influence this year in a brand new way. Politics and climbing have been kept mostly separate in the past, but as more and more public lands and protected areas are being re-zoned and threatened, climbers and the industry alike have begun to speak out. Patagonia led the movement to move the Outdoor Retailer show (and all its revenue) out of Utah over public lands policy. The Access Fund and the American Alpine Club teamed up with pro athletes to lobby for public lands on Capitol Hill. Most recently, there was unified outcry when President Trump took an axe to the Bears Ears and Grand Staircase-Escalante National Monuments, reducing their size by more than half. Bears Ears in particular is home to some of the most beautiful and iconic rock climbs in the country, but more importantly, it is also home to centuries worth of indigenous history and cultural value. The Access Fund has teamed up with the Inter-Tribal Coalition, raising $100,000 in a matter of days, to fight the decision in the courts. The fight is ongoing: find out how you can get involved here. At The Cliffs, we also expanded our commitment to giving. In addition to our ongoing ClimbUp program, we partnered with Discover Outdoors Foundation and formed our Young Women Who Crush mentorship program for inner-city girls. We contributed to the effort to replace bolts and anchors in the Gunks through the Access Fund and the Gunks Climbers Coalition, and we provided scholarships to the Women's Climbing and Color the Crag Festivals. We also recognized the importance of giving to causes beyond climbing: this year, we contributed to at-risk youth through April's Child and Covenant House, and humanitarian and social justice causes through GrowNYC, the Southern Poverty Law Center, and the Hispanic Federation Unidos Fund. Amidst all the growth and changes in the climbing community, a lot has happened Cliffside this year too. Scroll through the slideshow for some Cliffs memories. Next up, The Cliffs at Callowhill in Philadelphia! Opening in 2018. We partnered with Discover Outdoors to start Young Women Who Crush, a program that provides mentorship and longterm access to free climbing to inner city girls. Valhalla got a makeover: all new floors, lights, and a revamped party area! LIC's a lot brighter! We switched to LEDs and added new lights and fans to the entire gym. 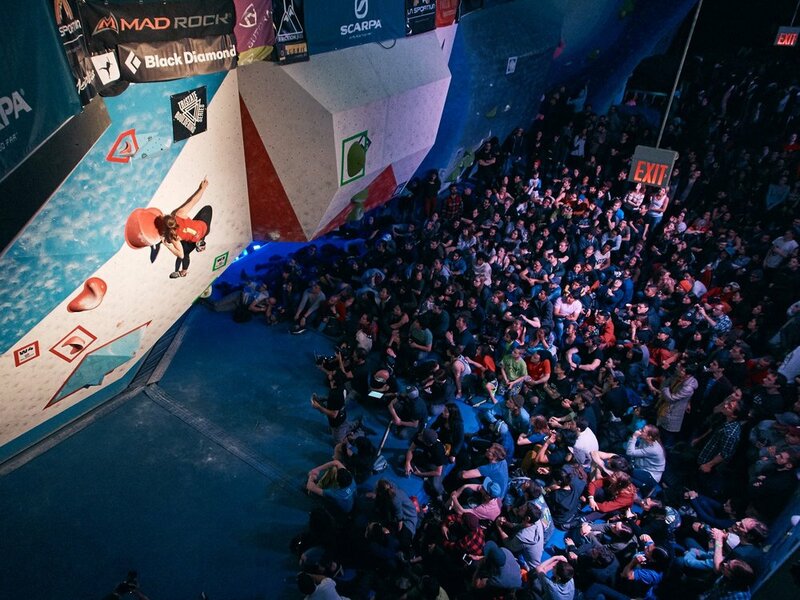 We were psyched to partner with our friends at Reel Rock again to host NYC's Reel Rock Fest. We have to give a huge shout out to our community. It's because of the people in climbing that we've been able to grow, to expand, and to welcome new friends, challenges, and homes. To all of you who joined us and stuck with us this year, staff and members alike, we're so psyched to have you. Just last week, we said goodbye to our longtime routesetter, Big Chris, who is taking over the local gym in New Paltz, but we'll still see him there and at the crag! In the sport on the whole, we experienced sadder losses: legends Fred Beckey and Royal Robbins, and some taken too young, Ueli Steck, Hayden Kennedy, and Inge Perkins. With all that said, we look forward to 2018 and all it may bring. New gyms, neighborhoods, and cities. New discoveries, ascents, and innovations. New friends, family, and community.